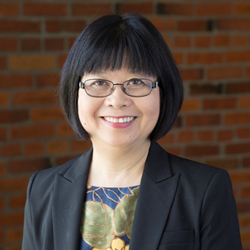 Belinda Louie is a professor in the Education Program and has taught at the University of Washington Tacoma for over twenty years. An avid reader and collector of children’s and young adult literature, she and her husband established an endowed collection of juvenile literature in the UW Tacoma Library. Her research has often focused on the role of reading and language in primary education. What aspects of your research are you most passionate about? My area of specialty is children’s and young adult literature, and I use it as a platform to go into language learning and reading instruction. One area that I focus on is online instruction and another is faculty development. I’m a bit of hybrid, like an English faculty member who is housed in Education. I originally got my bachelor’s degrees as a double major in English and History, then, went on to get my Ph.D. in Education with focus on K-8 and bilingual and bi-cultural education. I came to juvenile literature as something that could be used in my classes. Ultimately, I believe teaching reading is not just teaching a skill. A lot of Americans are aliterate. They can read, but they don’t choose to read, and they don’t love books. The alumni magazine once quoted me as saying, “Books will get offended if you use them without loving them.” I still believe that. You’re currently doing grant-funded research into English Learners in elementary schools. What are some of your findings about Washington State? I’m so deep into that research that it’s hard for me to comment right now. In Washington State, 9.8% of students are English Learners or EL, meaning that English is not the primary language spoken at home. If you look across the country, other states beat us in the overall number of EL students, but we have distinct honor of having the poorest record in preparing teachers to work with EL students. Currently, there is one trained EL teacher to 250 learners. This seemed like a perfect opportunity to apply for a grant, and we initially received funding to develop a program for training teachers. After collecting data and reviewing the literature, however, we saw that if you want to have big impact on EL academic achievement, you must train the principals. Leadership matters in creating an environment that supports EL students. The principals may not work with students, but they are the instructional leaders of the school. Ultimately, they decide what kinds of professional development opportunities are available for teachers. Our current grant proposal establishes a partnership with the Association of Washington State Principals, and I’m collaborating with Rich Knuth, who is a former principal himself and well-respected in the field. You published an article the ways that historical fiction can be used to teach a perspectives on a complex topic. How can this literature be used by educators? I looked at the ways Pacific Front during World War II was presented in literature from various Asian countries and found that each side was focused on its own suffering. For instance, the Korean literature tells of the pain caused by the Japanese, and the Japanese literature speaks of the pain caused by the Americans. Yet they each present very different perspectives of the war and create opportunities for discussions. It was a very difficult topic for me to bring up, but I tend to have a global perspective. I am forever international because I am an immigrant. As a Chinese person, I always remember the Japanese occupation of Hong Kong. People who read my article appreciated my critical analysis. Because I have a degree in history, I bring the cultural historical perspective into the story, as well. I tend not to read individual books but a collection of them, looking at how similar titles are to their neighbors. I do not want acknowledge it, but I’m very systematic in my reading habits. Name one work or author that has had a significant influence on you. My husband, Douglass Louie, is my mentor and has influenced me in so many ways. He tends to read widely and deeply when he approaches a topic—I don’t know how many doctorates has: he’s an M.D. with a J.D., a Ph.D. in Pyschology, among others. He prefers to get a much more comprehensive view on a particular point. Also, during some periods of my life, I was very sick, and he would go to the university library and bring half of an entire bookshelf home for me to read. He once ordered the whole archive of a journal so I could read the key articles without going to the library. That was the time before digital collections, when we could only read journal articles in the library. Learn more about Belinda Louie’s research. This entry was posted in Faculty Interview and tagged Children's and Young Adult Literature, English Language Learning, Faculty Teaching Development, Online Instruction, Reading Instruction on July 29, 2016 by taclibdc.